Those arguing for more immigration of high-skilled workers often trot out an argument that ties 1) securing patents with productivity, and then 2) ties the number of patents to the incidence of foreign workers. In other words, the more foreign workers, the more patents, the more production, and hence more general prosperity for America. It sounds superficially plausible. But coming from a family that produces copyrights rather than patents, and knowing that patents relate to physical things, narrowly, rather than to economic production, generally, I have often wondered about the argument. 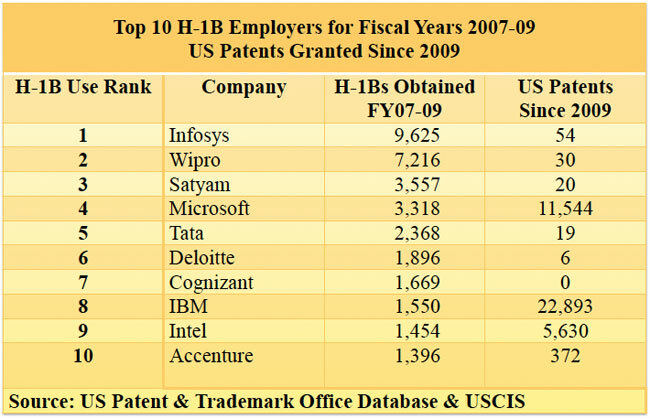 Last week, at an academic conference in Washington, I learned that there is no correlation between the numbers of H-1B workers and the numbers of patents. Hira's chart was just one of many interesting bits of evidence on display at a day-long session on high-skilled workers and immigration last Friday. It was sponsored by the University of Virginia's Miller Center. Unlike a somewhat similar conference earlier this year, put on by the Brookings Institution, described in an earlier blog, this one was carefully balanced between critics and supporters of the H-1B program. The Brookings event had 11 speakers, only one of whom did not cheer on the program. Among the other speakers at the Miller Center's daytime session were Madeline Zavodny, an Agnes Scott College professor, who outlined an interesting alternative way of selecting foreign skilled workers, a point system, rather than allowing employers (as we currently do) to make the choices; Michael Teitelbaum, now with Harvard Law School, who described the new British system in which a panel of experts (labor economists) makes published recommendations to the government about the admission or non-admission of foreign workers, which the government either accepts or rejects; and Michael Finn of Oak Ridge Associated Universities, who uses Social Security numbers to track the post-degree work histories of all aliens with high-tech PhDs. Finn said that a remarkably high percentage of those with these doctorates stay in the United States for five to 10 years after receiving their degrees. This, he said, is particularly true among those from India and China, who are the focus of much attention by the high-immigration advocates. These PhDs are staying anyway, so there does not seem to be any need to change our visa policies in order to keep them in the United States, he said. Finn's database, which he has used successfully for well over a decade, will disappear in the future because someone (he was not specific about what person or entity) has decided that asking the foreign Phds to reveal their Social Security numbers was an invasion of their privacy. He did not say so, but my reaction is that if U.S. funds are going to be used — as they are — to underwrite the vast majority of the costs of training these high-tech workers, then it is only appropriate that they give us their workplace identifier. Or we could simply say: "No SSN, no stipend." I skipped the evening cocktail party and speeches at the Press Club that were also part of the program; I figured I would not learn much from the ranking speaker, Sen. Mark Warner (D-Va.), a former high-tech entrepreneur himself and a predictable fan of foreign-worker programs. Note: The full name of the session was "The 2012 Mortimer Caplin Conference on the World Economy/High Skilled Immigration: Politics, Economics, and Law". Caplin was, at the time of my own arrival in Washington about 50 years ago, John Kennedy's highly regarded IRS Commissioner. I thought it was commendable of either Caplin's foundation, or his estate, to fund what apparently is an annual policy discussion, each with a different topic. But it turned out that the lively little man in the front row at the conference, who was following every word, was, in fact, Mortimer Caplin, now 96. We talked at a break in the session, I thanked him for supporting the day's activities and we agreed that we were probably the only two people in the room who had held political appointments in the Kennedy administration.